During my freshman year, I was placed in a “first year seminar” with Dr. David Shaner titled “Life as Connection: Monism.” Going into the class, I truly had no idea what to expect. By the end of the semester, I had gained a refreshing perspective on myself and on the world. The underlying idea of the course is that we (“we” being all living and even non-living things on earth) are very closely interconnected. We studied the idea of being one with our surroundings and the deep calmness that comes with knowing that we are part of something more complex and more perfectly created than we could ever imagine. I learned, understood, and appreciated for the first time a cliché yet monumentally important life lesson: When we get caught up in the rush and clutter of life, we tend to lose focus of the bigger picture. Fast forward three years. I’ve changed in more ways than I can count. I’ve switched career paths, studied eight semesters’ worth of courses, and worked on campus, in schools, and in the community. I’ve met incredible people, studied captivating cultures, and traveled the country and the world. With every experience, I’ve learned a little more about life. In one way or another, nearly all of these lessons circle back to the central idea that I learned from Dr. Shaner’s monism course: as expansive as the world is, everything is interrelated. This powerful concept has a lot of implications for humankind, including what it means to live sustainably. Oftentimes, “sustainability” is oversimplified to become synonymous with “environmental science.” This somewhat generalized view shouldn’t necessarily be discounted; in fact, part of living sustainably is maintaining the very resources that make life on earth possible. However, there’s more to it. To me, the interconnectedness that I learned about in Dr. Shaner’s class constitutes sustainability in the personal, philosophical, and religious realms. During my final semester as a Bank of America Sustainability Fellow at the Shi Center, I happened to be assigned with a project about Furman’s Place of Peace. 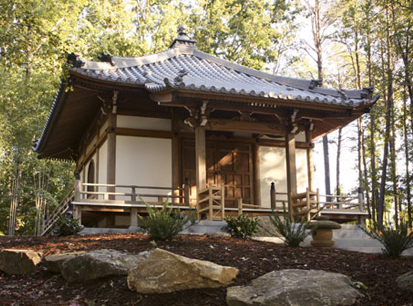 Dr. Shaner was extensively involved in the process of bringing this iconic temple from Japan to Furman in 2004, and it has become a symbol for “personal sustainability” and “deep calmness” on campus ever since. Motivated by Dr. Shaner’s retirement in December 2012, this project aims to compile and organize as much information as possible about the history, significance, and purpose of the Place of Peace. Not only does the very assignment of this project constitute a neat full-circle learning experience (talk about interconnectedness! ), but it comes at an interesting time in my life. With graduation just a few months down the road and with nearly constant thoughts about what’s coming up in the next few years, reading and writing about the Place of Peace is a nice reminder to remain in the moment and maintain tranquility. With this project, I hope to preserve valuable information about the Place of Peace so that generations to come may learn and apply the ideas of personal sustainability, deep calmness, and interconnectedness to their own lives.